One of the joys of a vacation, for me at least, is food. Not necessarily huge quantities but it must be interesting, perhaps reflecting the ethnic makeup of the destination, and it should always be delicious. 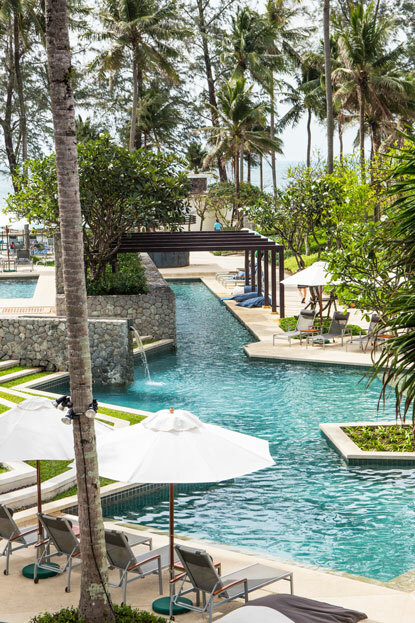 Outrigger Laguna Phuket Beach Resort ticks all those boxes. This rather smart and beautifully Thai hotel (read my article here) can boast great dining opportunities from breakfast to dinner, and a few other options in between. Perhaps the only negative aspect of eating at Outrigger Phuket is finding time to do it. Yes, there are sports activities to enjoy, as well as the essential pastimes of reading a good book, and sun-soaking. Outrigger dining offers the visitor plenty of choice. Executive Chef Roberto Conrad runs a tight culinary ship and that shows in all the food outlets at Outrigger. The celebrated Locavore Restaurant is open all day and the gastronomic adventure starts with a copious and varied breakfast. Those dishes are broad-based and eclectic. This will appeal to guests from across the globe, with all those diverse morning cravings. The restaurant has both air-conditioned and al fresco seating. The kitchen is open and provides a little theatre, with able chefs making egg dishes while others heat noodles. 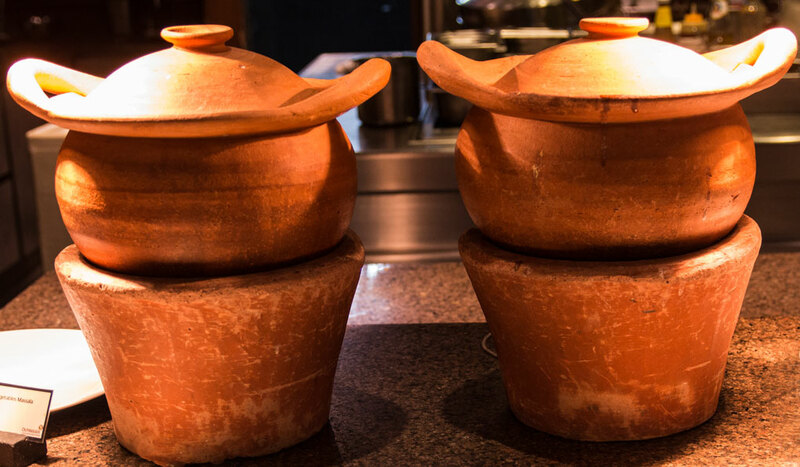 There are always a couple of curries in impressive terracotta pots. There might be an Indian vegetarian dahl or a more local chicken curry. There are chafing dishes of stir-fried vegetables, steamed fish and congee rice porridge with toppings. A breakfast at Locavore constitutes a journey around Asia. But what of those holiday-makers who prefer an equally delicious but more predictable Western start to the day? For those there are piles of crisp bacon and those aforementioned eggs. The baker at Outrigger, chef Anders Olesen, is first-class and his goods are displayed every morning. Filled bagels, sourdough loaves and Danish pastries tempt, to partner the awaiting cup of good coffee. Those looking for lighter fare will enjoy the bowls of exotic fruits such as passionfruit, dragon fruit and crisp Asian pears. Locavore has something for every member of the family, and the array is constantly changing. Lunch and dinner are real treats of wonderfully presented Asian and European favourites. But nothing can beat the evening meal at Locavore, when people have more time to relax in convivial comfort. If one wants to try the best of Thai cuisine, then here is an ideal opportunity. Gaeng Massaman – beef or chicken Massaman curry – likely originated in Central Thailand at the court of Ayutthaya, several hundred years ago. Other sources suggest that Massaman is a southern Thai dish, influenced by the more distant cuisines of Malaya and the Indian subcontinent. Either way, this curry is well-spiced and memorable. 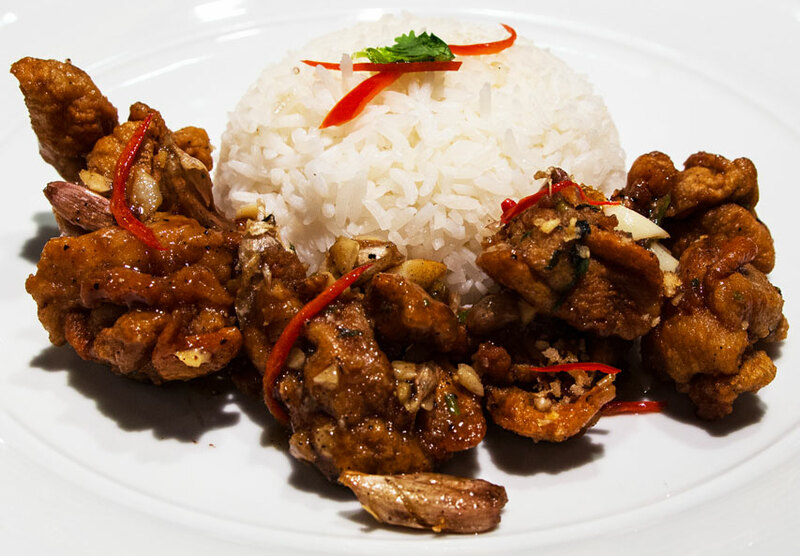 Gai Kratiem Prik Thai – wok-fried chicken with garlic and pepper – is a comforting Thai classic and done very well here. The Kratiem Prik paste is simply made with just a few key ingredients, including the indispensable garlic and black pepper. This is a must-try at Locavore. Beef Rendang is another dish that is full of flavour, with that signature melting texture. It is slow-cooked, allowing aromatic spices to meld with the meat to create a rich dish that only needs some rice as a companion. But I know which dish will grab the attention of many guests for their first dinner at Locavore. This is a version of the ever-popular Phad Thai, and here it is elevated several notches to become Phad Thai Nueapoo Goong. This is a large (did I mention that portions are considerable here?) and striking bowl of traditional fried noodles with tamarind sauce, bean sprouts, garlic chives, crabmeat and grilled prawns. 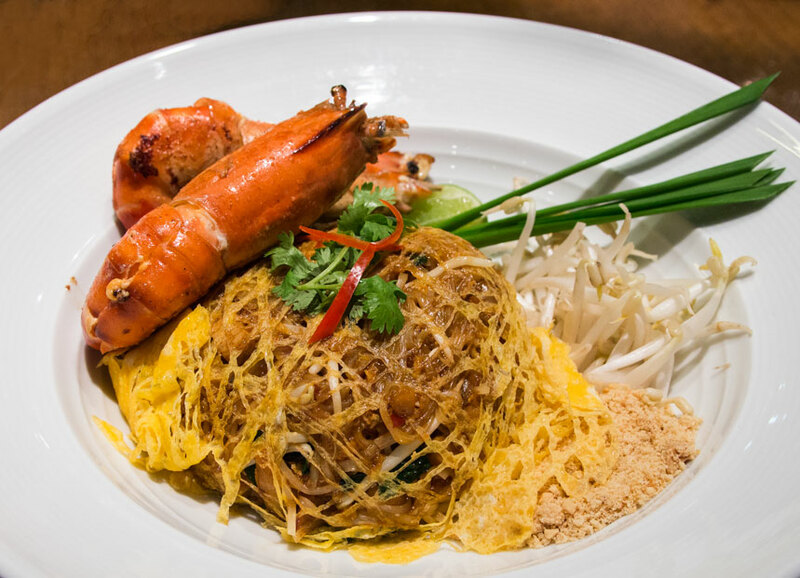 All of those ingredients are encased in a delicate net of egg, and served with a brace of huge prawns. Does dinner get much better than this? I think not! The local dishes are well represented here, and as an alternative the Special Evenings of lobster and barbecue are always popular. But vacationer cannot live by mains alone. Yes, there are desserts, and the Thai ones are so beautiful that they are almost too good to eat. One will find them at the end of those gourmet evenings, but some of those well-crafted sweets might even put in an appearance for breakfast, too. These are not the over-sweet confections one would expect from a European dessert array, but rather small and delicate creations that reflect their mild ingredients. Takoh – Coconut Cream Jelly – is made from coconut, wrapped in a banana leaf and steamed to create a delightful light coconut custard. And the bonus of these diminutive Thai desserts is that you can have more than one and enjoy it without guilt. Look Choop – mung bean sweets – could almost constitute one of your five a day. They are made out of beans, so one could consider these gems as health food. Crushed and sweetened mung bean paste is formed to look like tiny fruit, and glazed to a colourful and glossy shine. They are miniature works of delicious art. Outrigger Laguna Phuket Beach Resort is an ambassador for good food, and for Thai dishes in particular. There are European favourites and they are excellent, but those Thai creations have stolen my heart. I will return to eat my way through the rest of the menu, and perhaps go back and sample more Phad Thai Nueapoo Goong, followed by a selection of refreshing fruits and a platter of dainty Thai petits-fours!